The Swiss based Divi’s Laboratories Europe AG is supplying a full spectrum of carotenoids and specialty vitamins, both synthetic and natural to the nutritional, pharmaceutical, cosmetic and feed industries since 2006. The company has a fully validated and backward integrated manufacturing process from the molecule to the finished form. 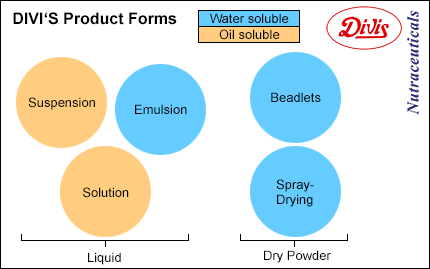 Divi’s has great expertise in chemical synthesis and in depth know-how in formulation. Divi’s provides a full range of technical assistance including application, analytical and regulatory support. The group has analytical laboratories with capabilities beyond standard product testing. Divi’s works closely together with its customers to deliver innovative solutions for their specific needs in their product development and applications. All operations are certified and maintained according to ISO 9001, ISO 14001, OHSAS 18001, HACCP guidelines. In addition they are inspected by FDA and certified FSSC 22000. Divi’s is committed to meeting the growing expectations for safe, reliable and traceable products, now and in the future. This is why the quality system is built into the entire supply chain process from sourcing raw materials to delivering finished goods. The quality control programs monitor every step of this process which guarantees complete and fast traceability. Divi’s strict change management system provides full transparency to our mutual customers. Beginning of 2017 Divi’s started working with innotaste as their distribution partner in selected markets.